Whether walking the dog or waiting for a train, autumn and winter offer plenty of opportunities for getting a cold head. 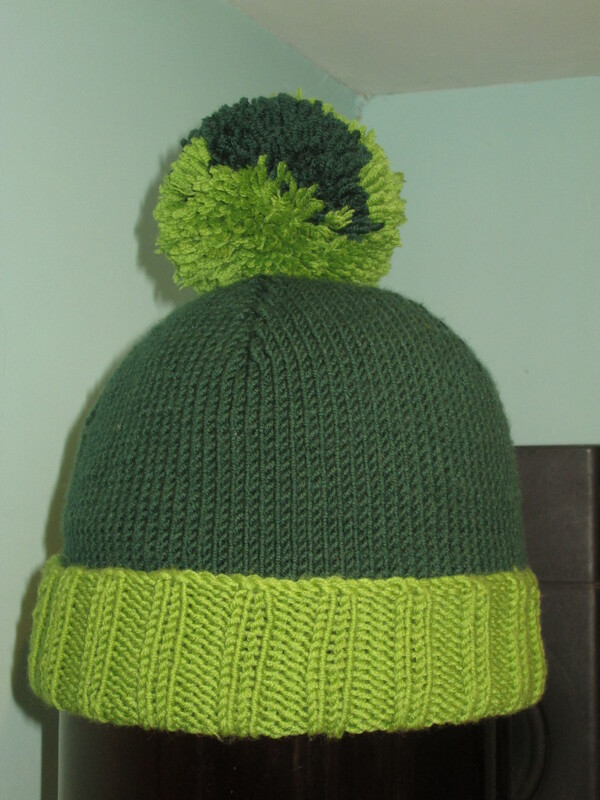 A friend of ours had been asking for a bobble hat for a while; it took me a while to actually knit him one as it needed to be just the right shades of green. Eventually I found merino yarn in just the right colours and all that was left to do was come up with a pattern… I give you the Platform 5 Hat. Knit in DK yarn on 4mm needles, I used 1 ball of Katia Merino 100% and 1 ball of Patons Merino Extrafine DK. Use whichever technique you prefer for knitting in the round, I started using travelling loop and switched to using 2 circular needles at the decreases. In contrasting colour, cast on 110 stitches and join in the round. Ribbing: (k2, p3) repeat to end of round. Continue ribbing for 3 inches. Knit all stitches of each round for 4.5 inches. Cut yarn leaving a reasonably long tail. Using a yarn needle thread tail through remaining stitches and pull tight, secure as you feel happiest, weave in ends. Using all remaining yarn of both colours, make a 3.5inch diameter pompom. Attach pompom to top of hat. Having decided that every knitting project I started this year should include a technique new to me in some way, I found myself needing to knit a second hat to a pattern I’d used just before Christmas. The question was how to integrate a new technique into something I’d done before. I’d recently bought two books in The Works, Knit Step By Step and Crochet Step By Step, so decided to try the Twisted Double Cast On shown in the former. If I’m honest I didn’t get it quite right! I got a cast on edge which wasn’t going to unravel but instead of the very stretchy cast on promised I got an edge with much less stretch than my usual Long Tail Cast On; however, I think I can see where I went wrong so I will have another try before too long. I was more successful with a second new technique I tried. I’ve always used magic loop when knitting hats in the round, the only method I knew of knitting a tube with a smaller circumference than the length of my circular needle. On this hat I was just finding magic loop really irritating; so much time wasted pulling the spare length of the needle’s cable through twice per round, and it wasn’t really a long enough cable. I decided to see if it would work just having one loop for the spare length of the needle, sure enough it did. Of course I knew I couldn’t be the first to use this technique so the next challenge was to find out what it was called; Ravelry to the rescue, another knitter made sense of my description of what I’d done and was able to tell me it’s a technique called Travelling Loop. 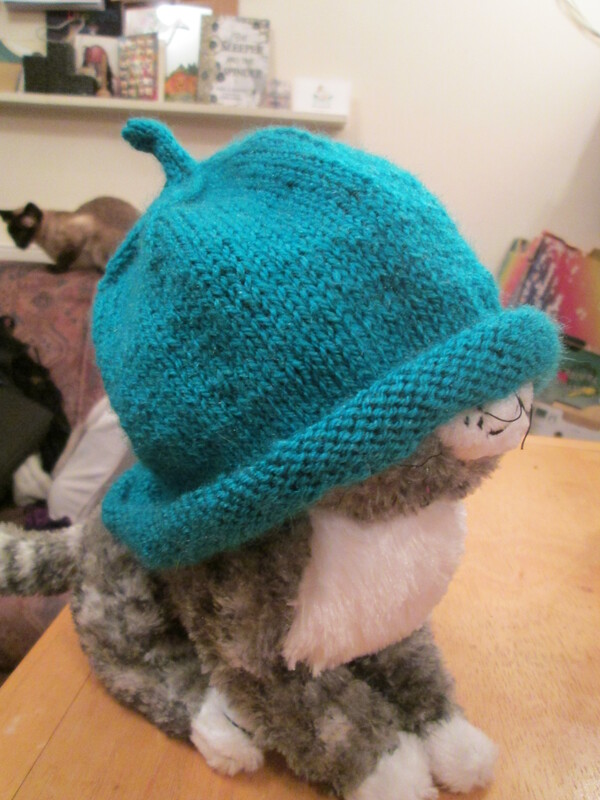 I didn’t think to take any pictures to illustrate the techniques I was trying, but here’s the finished hat (as modelled by Mog). “Cats sleep anywhere, any table, any chair”, as Eleanor Farjeon’s famous poem cheerfully informs us. 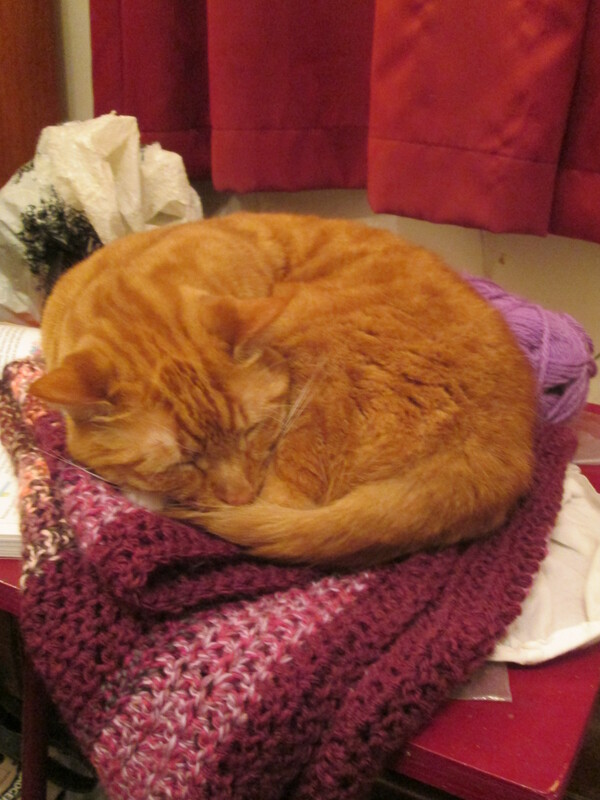 Well, at the moment our feline companions mostly sleep on my crochet, even going so far as to climb into my project bag and nest amongst the folded blanket and balls of yarn; every time I put my project down it gains a cat. 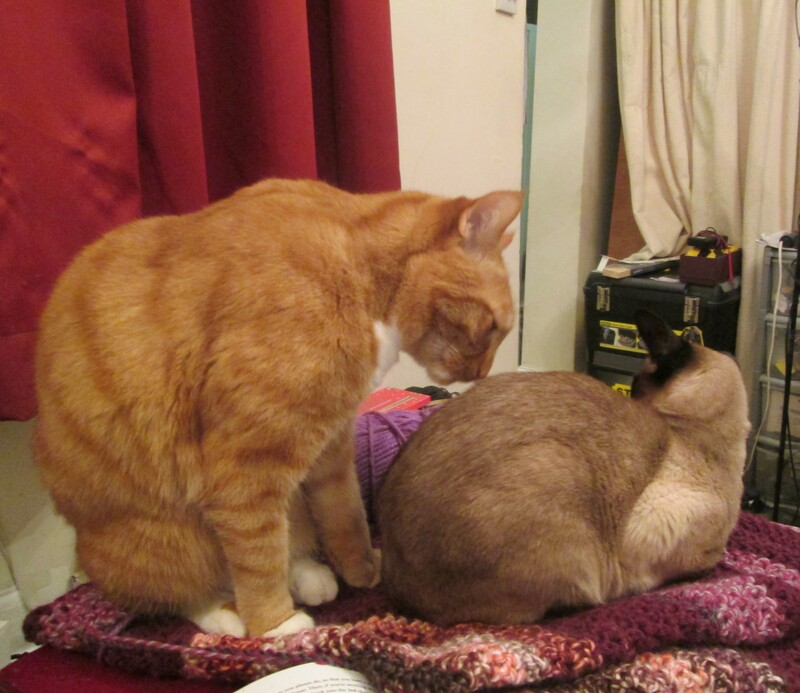 I don’t really mind them sleeping on it, there wouldn’t be much point crocheting a blanket the cats weren’t allowed to sleep on and it does tell me it’s going to be nice and warm. I may not have found time to write about doing so but I did find time to keep trying new recipes throughout December. My final three efforts of 2014 were Turkish Delight, French Chocolate Cake, and Beer and Mustard Bread. I’ve been wanting to try making the Turkish Delight since being given Gifts From The Kitchen a few years ago, it just took me a while to brave my first attempt. This was a mixed success, it tasted good but I definitely didn’t have the texture right; boiling for longer at the final stage is obviously required but it had reached the point that I was struggling to stir it and was getting blisters. 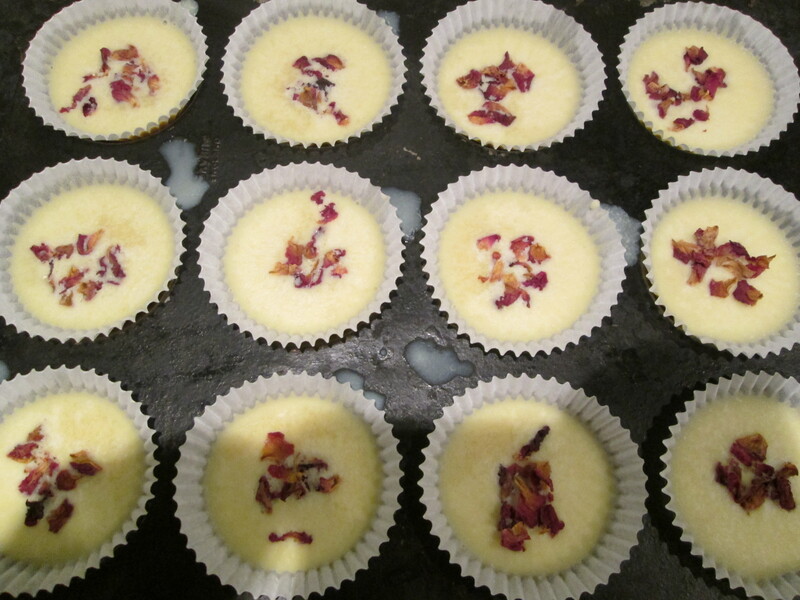 The recipe was reasonably easy to follow and although it is time consuming and wasn’t a great first attempt I probably will try again some time as I do love Turkish Delight. The French Chocolate Cake, from the simply titled Chocolate, was a greater success; just as well as I was baking this as a gift. It was more complicated than my usual ‘throw all the ingredients in the food processor then chuck the mix in a sponge tin’ approach to cakes, but the recipe was well written and easy to follow and the results were (so I’m told) good. Beer and Mustard Bread, from The Cook’s Encyclopedia of Bread Machine Baking, was very easy to make; using the bread machine still feels a bit like cheating but it’s a nice sort of cheating. I baked this as part of a Boxing Day buffet and I think it’s fair to say it was good as I’ve never seen a loaf disappear so rapidly. Possibly the perfect bread to eat with cheese. Try a new recipe from one of my cookery books each month. 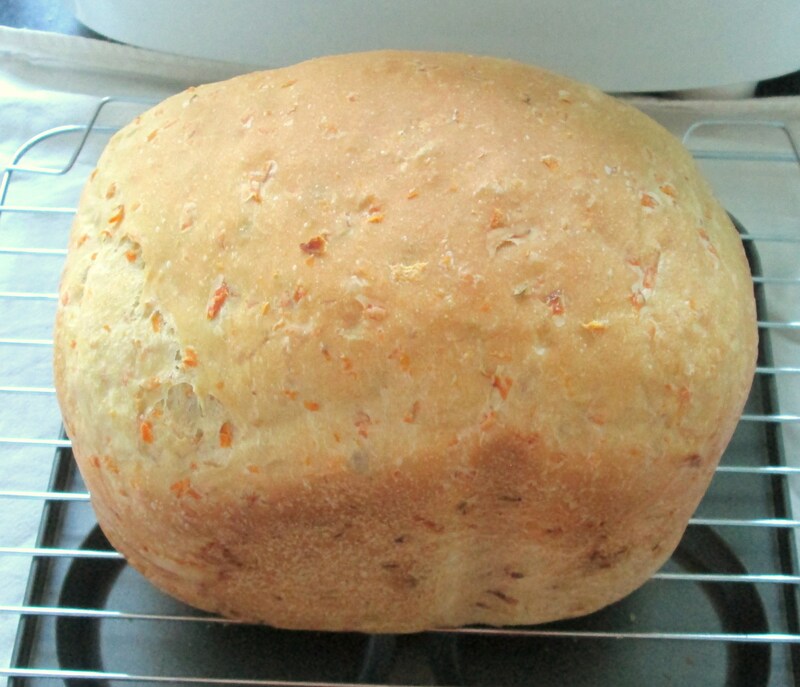 Try a different bread recipe every time I bake. Learn something new with each knitting project I do (the two projects I’m carrying over from last year are exempt from this). January saw me start all three of these goals! The recipe I tried was Broccoli and Cauliflower Gratin from Vegetarian Classics. I cheated and used a bag of broccoli and cauliflower florets rather than chopping my own, this was a mistake as they weren’t well enough matched in size so I had to choose between extra firm cauliflower or soggy broccoli. I wasn’t particularly keen on the yoghurt and cheese mix used a a sauce either, I think I would have preferred simple grated cheese or a more classic cheese sauce, the yoghurt flavour dominated. Not one I’m going to be making again. The bread was far more successful than the supper dish. Chickpea and Peppercorn Bread from the same lovely book as the Beer and Mustard Bread. This doesn’t use gram flour (which you might expect) but combines white flour with tinned chickpeas. The chickpeas blend into the dough and create a rich bread with a moist, slightly heavier crumb. It’s delicious and filling; it also seems slow to go stale, I baked it on Saturday and it hasn’t started to dry out yet (maybe that’s partly thanks to the bread bin I was given for Christmas). 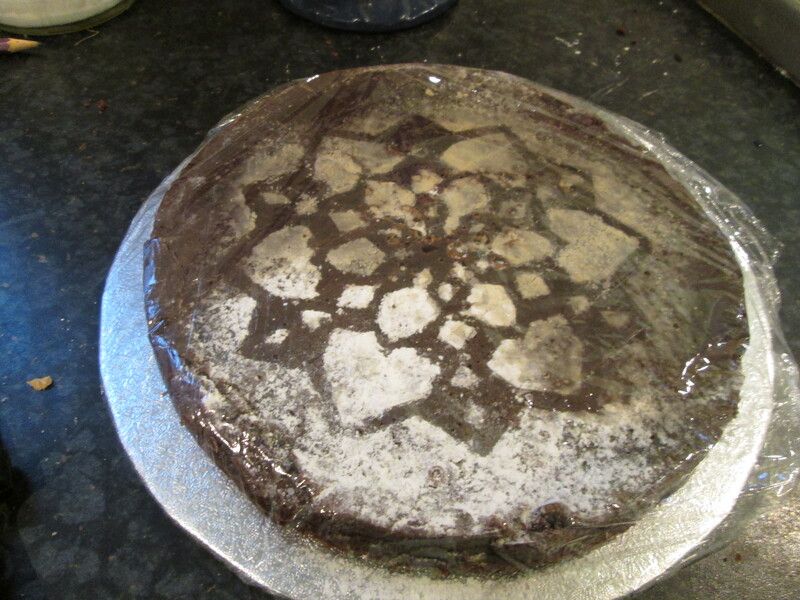 I will bake this again but will probably omit the peppercorns to give myself more choice what I eat with it. The knitting was the first of a string of selfish projects, a hat for myself. 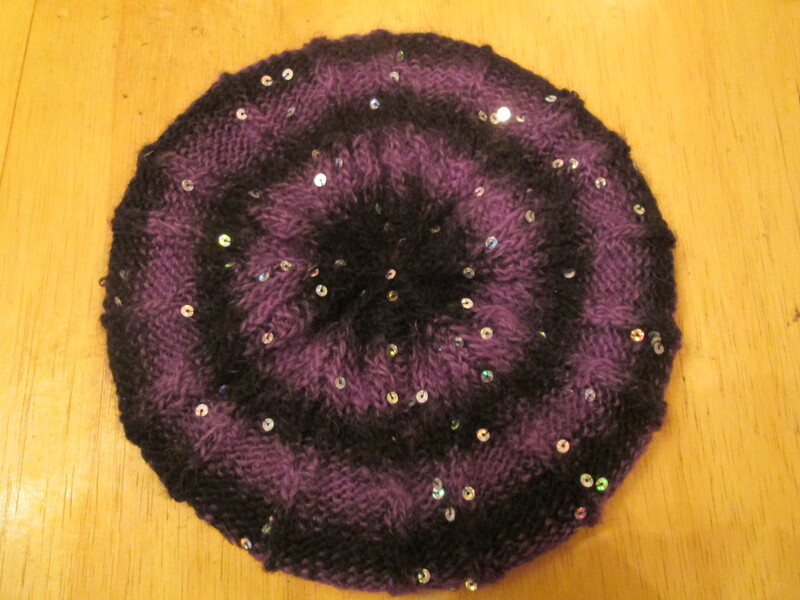 The pattern is Sandra Dee’s Nymandus Draculea and the yarn is King Cole Galaxy. King Cole seems quite a fine DK so I used 4mm needles, not the 6mm called for in the pattern, and put in an extra pattern repeat. The new, to me, technique was cabling; little, baby cables where just one stitch crosses another, but there were quite a lot of them. The cables don’t show as well as they might in a slightly heavier and plainer yarn, but that’s not necessarily a bad thing! I know that I was a bit clumsy with my cables at first, though they got neater as I became more used to doing them, so having a yarn that distracts from the slight unevenness of my cabling isn’t such a bad thing. 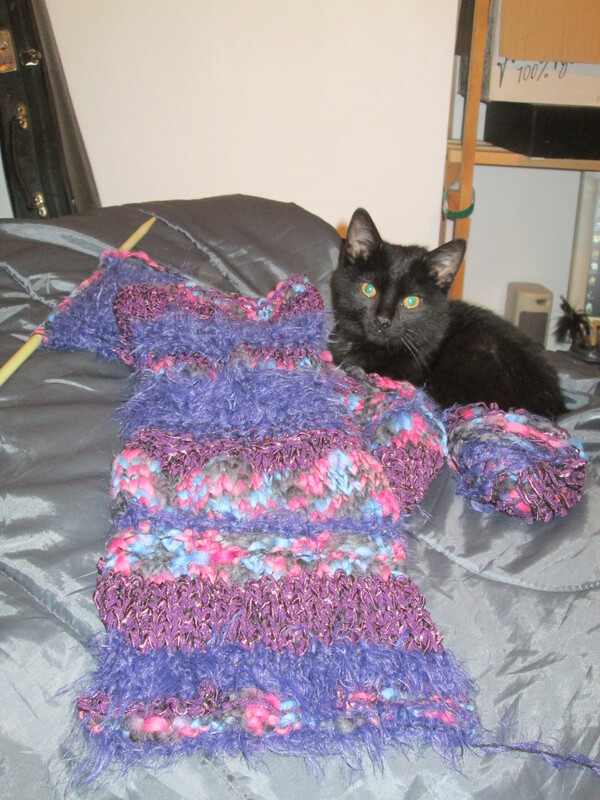 It took me about ten evenings to knit, I might have finished a little faster but I decided not to work on it when I was tired as I didn’t want to risk too many mistakes (feline assistance led three or four dropped stitches I needed to rescue without adding sleepiness into the equation). I’m happy with my hat, I might even knit it again in slightly chunkier yarn, and, having bought more yarn than I needed, I have the next project queued to start using galaxy; the Railway Modeller will just have to get used to me in stripes! Despite planning ahead and making sure I had all the ingredients I didn’t quite get around to trying a new recipe this week. So, instead of writing about someone else’s recipe here’s a really simple one of mine, though not one to eat! The ones on the left are very rose, the ones on the right are rose and sandalwood. I also plan to make some with sandalwood and patchouli, some with lemon and eucalyptus, and some Christmassy spiced orange ones. To be honest I’ll probably just keep experimenting with scents as the mood takes me. Put the cacao butter and almond oil in a double boiler and heat gently, stirring continuously, until the cocoa butter is all melted and the oils are evenly mixed. Add your choice of essential oils and stir well. Pour into your choice of moulds or cases; I’ve used 1/2 to 2/3 filled cupcake cases but you could use petit fours cases or silicone moulds. Add any flowers or herbs you are using. 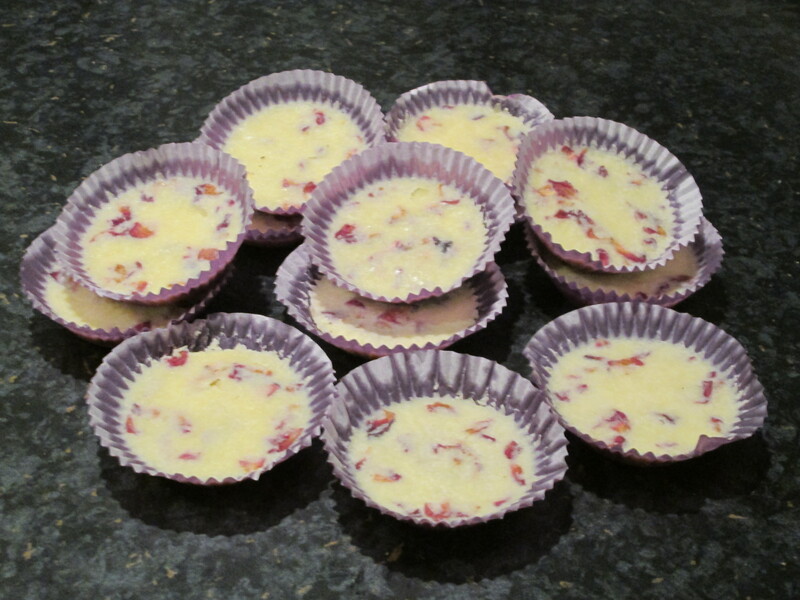 For them to be mixed through the bath melts add straight away; if you want them to be a finishing touch on the top wait an hour or so, until the melts are starting to set. Great for gifting or for self indulgence! Normally if I have a day at home on my own there seem to be a never ending procession of chores that I need to catch up with, sometimes though I get a day when all I need to do is whatever I want to do; yesterday was one of the latter. I’ve been wanting to make more use of the mint from the garden so I started the day by finding a recipe for apple and mint jelly, simmering the fruit with a bunch of mint and leaving it to strain for several hours while I did other things. Coffee was my next priority and, as the kitten was sleeping, I decided to spend an hour knitting while I indulged in my caffeine habit. I’ve a couple of projects on the needles to choose from but I’d rather like to have the current scarf project finished to give as a birthday present later this month, though realistically it might end up as a Christmas present. I’m enjoying the slightly crazy yarn I’m working with even though I’m experiencing a touch of mid-point tedium with the project itself. I suspect it’s the type of yarn you either love or hate, I’m fairly confident the intended recipient will love it. From the sofa back to the kitchen to make bath melts. I came up with the basic recipe for these several months ago, and have enjoyed some myself and gifted others. As I was finishing my coffee prior to making yesterday’s batch I received a hint from the last person I made some for that they might like some for Christmas, I think this is a recipe I should be writing up! After making the bath melts and putting them aside to set I stopped for a late lunch before doing the dishes. It’s amazing how much easier washing up is when you’re doing it to create the space to do something fun rather than just because it needs to be done! 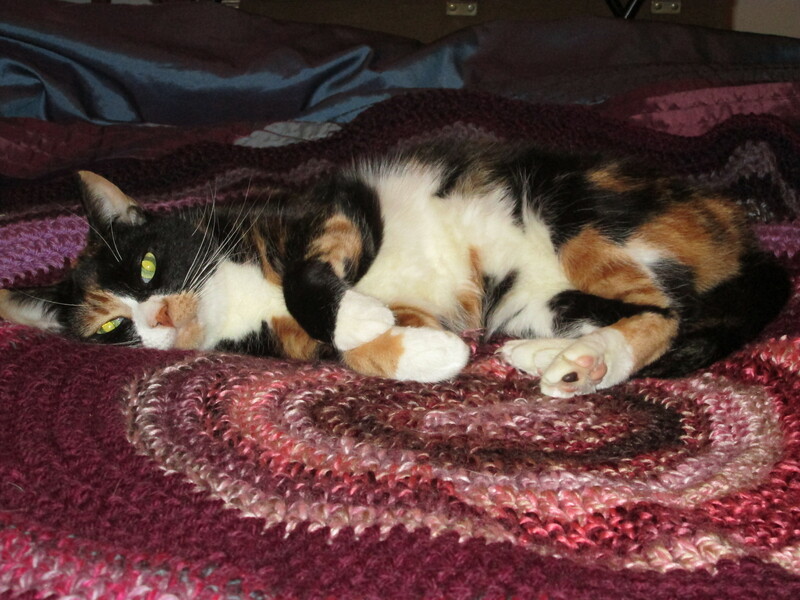 A bit more knitting and some play time with the cats had to be fitted in, then it was time to make the jelly. Chopping the mint that was going to be mixed in at the end took quite some time but eventually I was happy that I had enough and that it was fine enough. Jars went into the oven and jelly making proper began. This was a slightly experimental jelly in that I was using my sugar thermometer to tell me when it was at setting point; normally I test for set using the chilled plate technique but, since it was a relatively small batch and I would have time in the week to reboil it if needs be, I thought it a worthwhile experiment. Initially it did seem quite liquid in but today it looks like it has set properly, obviously the true test will come when we sample it. 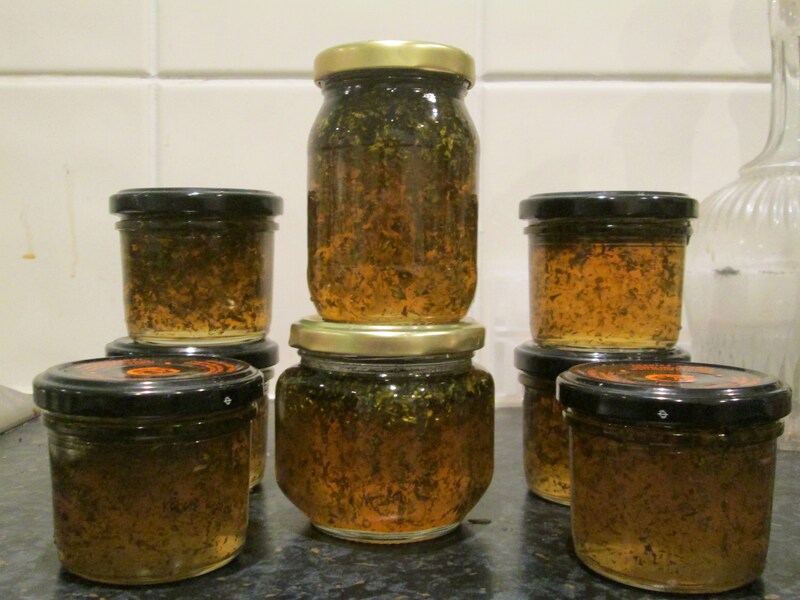 I have to say, I think it looks rather pretty in the jars, hopefully it will taste as good as it looks.